I was playing around with quotes I wanted to cross stitch, and I accidentally made these awesome patterns that didn't fit in a normal sized photo frame, and had heaps of off cut adia in that size that I wanted to use up, so I played around with some fonts, seeing which ones came out well cross stitched. This got kinda wonky somehow, I was seriosuly careless with my counting. Bad bikyclist. I love the font used for 'taken' but it uses so many stitches! Haha, its wonky because after the first line it stops being centred! 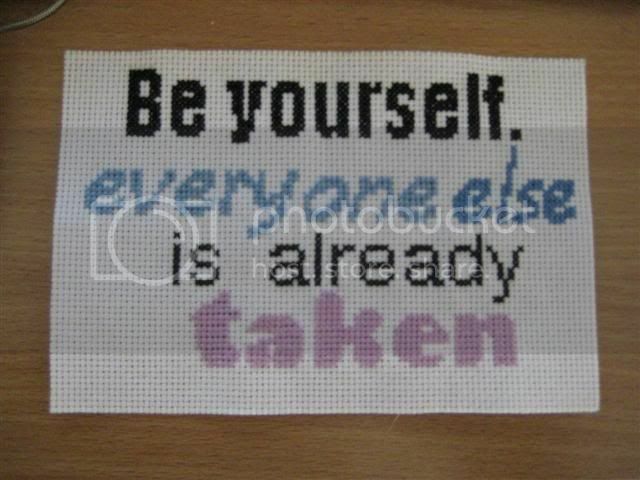 If you look at the 'Be yourself' line and compare it to the 'taken' line, 'taken' is so far off the middle!